Content marketing is an essential component of any modern marketing strategy. Today’s customers are more savvy than ever, and content marketing offers a way to communicate with clients and prospects without overtly selling. According to Forrester, consumers engage with 11.4 pieces of content prior to making a purchase. In order to drive sales, the concept of offering valuable content to inform and persuade clients should be at the center of all of your marketing initiatives. A clear and targeted content marketing strategy can be an incredibly effective way to drive high quality leads and sales online. Here are three ways marketers can leverage content marketing to engage with clients and prospects and drive profitable action. The key to a great content marketing strategy is to align it with the customer journey. Develop well-crafted, persona-tailored content that engages with customers throughout every step of the customer lifecycle and encourages them to move to the next step. Content should be a supplement to the sales pitch. 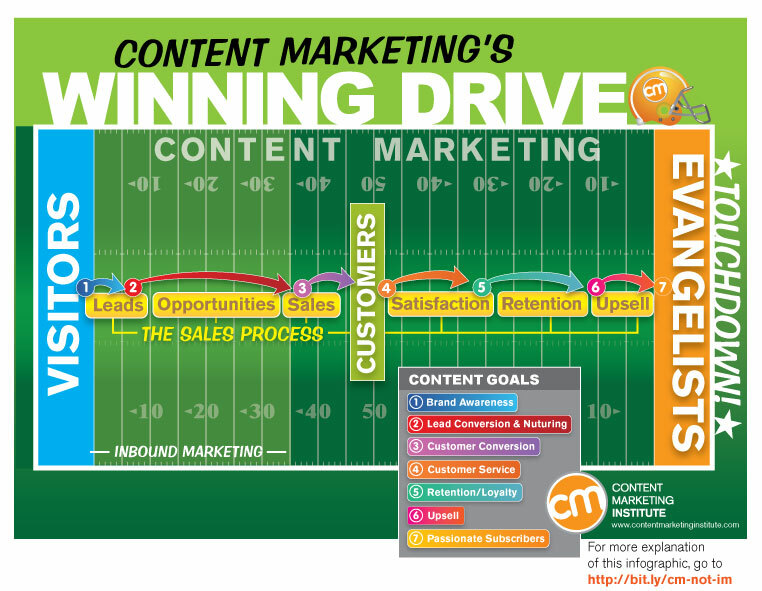 Check out this content map the Content Marketing Institute created. Don’t forget to measure the response from each content piece to better understand where you might need to revise your story or fill content gaps. The goal of content marketing is to create relevant, value-based content with the intention of changing customers’ mindset and behavior. Offer helpful, informative, and insightful content that provides value to target audiences. The more relevant the content, the higher quality leads you will attract. Take for example, Sephora’s brilliant sales-driven content marketing. The French-based beauty brand promotes beauty tutorials through videos, blog posts, social media, and a mobile app. Sephora’s strategic approach to content engages and informs make-up addicts while building interest in its products. It doesn’t matter how great your content is if no one is reading it. An integral part of a successful content marketing strategy is distribution. It’s important to understand that there are three main types of distribution: earned, owned, and paid. Owned: Just like it sounds, it’s the media your company owns, such as white papers, eBooks, blogs, etc. Earned: Content or publicity that someone else distributes for you, such as guest blog posts, articles, forums, or communities. Paid: Distribution for which you pay, such as Google AdWords or PPC campaigns. If you’re just starting out, focus on owned and earned first. Identify the ideal outlets within internal and external channels for your target audiences, and determine your goals and objectives for each channel and outlet. Each outlet will have a different set of requirements and best practices, so it’s important to do your research and track the success of content shared within each channel. Content marketing is integral to driving sales today and in the future. As the marketing and digital landscape continues to evolve, it will be increasingly important to engage with potential and current customers through value-based content. Make sure you have the basics down, so you’re able to build and evolve with the future.